Georges Braque was born in Argenteuil, France on May 13, 1882. In 1890, the family moved to LeHavre where he helped his father in the painting business and attended LeHavre Art Academy beginning in 1899. In 1900 he apprenticed to a painter in Paris while attending drawing classes at the school in Batignolles and then at the Academie Humbert. After seeing an exhibition at the Salon d’automne in Paris in 1905 he was impressed by the work of the “Fauves” and began using the bright colors in his art and in 1907 exhibited with the “Fauves” in the 1907 Salon des Independents. Also in 1907 he met Pablo Picasso and a close friendship began after that meeting. After examining the work of Paul Cezanne, they developed the Cubist style of painting and exhibited in the gallery of Daniel-Henry Kahnweiler in Paris in 1908 and cooperated on works until 1914. After serving in WWI where he suffered a severe head injury, he convalesced until 1917 and did not exhibit again until 1923. After that, he worked mostly with sculpting and pottery. 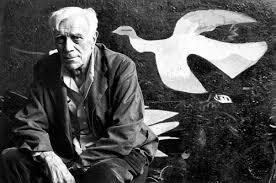 Georges Braque died in Paris on August 31, 1963.